Visual field testing provides our Houston and Katy offices with essential information about the diagnosis and progression of blindness causing diseases. This testing is a primary tool in the diagnosis and monitoring of glaucoma. When we do a visual field analysis we are testing the light sensitivity of the peripheral portions of the retina and the peripheral visual field. Abnormalities in the visual field may indicate optic nerve disease, multiple sclerosis, brain tumor in addition to many other neurological and systematic diseases. 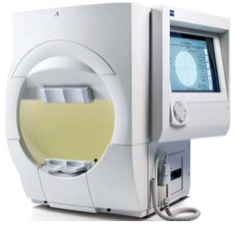 Our Houston and Katy eye care offices utilizes the Humphrey Visual Field Analyzer. This instrument has become the standard in the world for visual field testing.